Plentiful sunshine. High 73F. Winds NW at 10 to 15 mph..
Tarondia Harold (13) of Walker High scored 12 points in the Lady Cats' win over Live Oak. Walker High's Tiara Young (23) knocks down a jumper from the lane at the 5:39 mark of the first quarter to register the 4,001st point of her career. Walker High's Candace Ellis (33) gets past a East Iberville defender and takes the ball down the lane to the basket. WALKER – Walker High assistant coach Meoka Young set the scene for her daughter Tiara Young several days before. With the Lady Cats playing at home for the first time in 2019, the elder Young made her daughter aware that she needed six points to reach 4,000 in an impeccable career that began in the seventh grade at Evangel Christian in Shreveport. 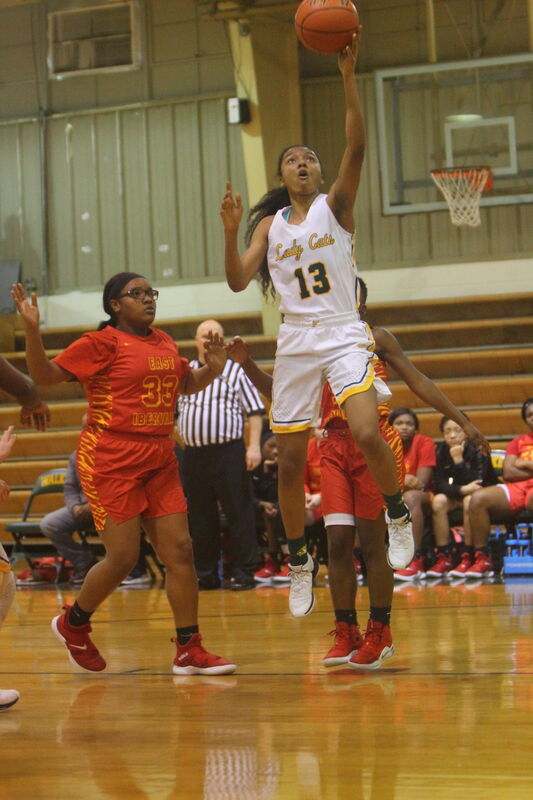 Tiara Young needed less than three minutes to accomplish the feat, scoring five quick points on a 3-pointer and layup off a turnover, to set up the moment at the 5:39 mark of Tuesday’s game with East Iberville at Glenn Ellis Gymnasium. 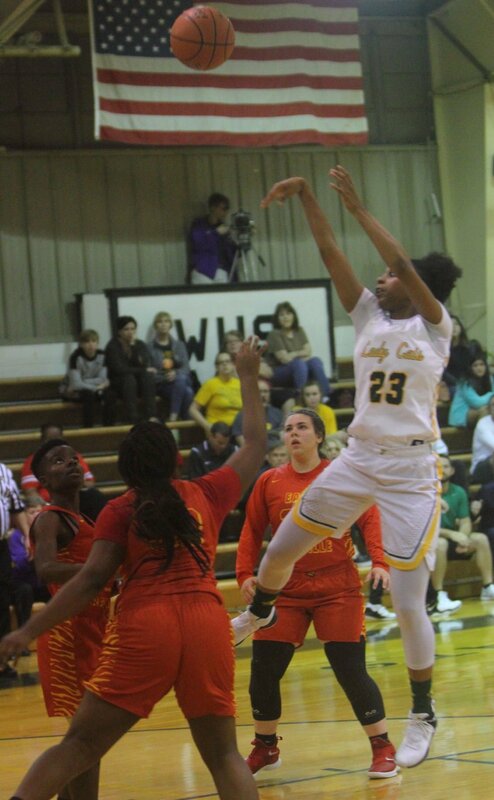 Young got the ball on the right wing, took a couple of dribbles and crossed-over her defender to drive into the lane and knock down a short jumper, part of a fast start that carried Walker to a resounding 77-34 victory over East Iberville. According to the National Federation of High Schools, Young became the 15th player to reach the 4,000-point plateau and eighth from Louisiana. With her 27 points, Young increased her career total to 4,021 points and based on her 32-points-per-game average is well on pace to catch Missy Thomas of Gibsland-Coleman (1992-95), the state’s career leading scorer with 4,506 points. Adrian McGowen of Goodrich, Texas concluded her career in 2006 with a national record 5,424 points. Walker played like a team ready to make amends for a 68-44 loss to Lee Magnet in last week’s Sugar Bowl National Prep Classic, a setback that knocked the Lady Cats (20-4) into consolation action. Walker, which held the No. 1 power rating in Class 5A, pressed and shot its way to a 32-8 first-quarter lead, doing so against an East Iberville team (22-4) that was No. 1 team in the Class 1A power ratings. Young led the way with 11 first-quarter points while Walker took its first double-digit lead (15-5) on Victoria Smith’s free throw. That started a 17-3 run over the last four minutes of the quarter with Tarondia Harold scoring six points and Mekayla Rothman adding five that included a 3-pointer, to make it 32-5. Harold scored all 18 of her points in the first half, burying a 3-pointer at the 6:27 mark. Candace Ellis took a bounce pass from Young and scored on a layup, while Harold scored again after Smith ignited a fast break with a blocked shot. Five straight points from Young midway through the second quarter increased Walker’s lead to 44-15 when the Lady Cats moved the ball around to Jones’ liking with a pair of nifty passes that resulted in layups and a commanding 50-18 advantage. Rothman found Lanie Miller cutting toward the goal with 1:07 remaining and Delaney Anderson connected with Ellis on a similar play with 16 seconds until halftime. Young got creative along the baseline, driving past a defender and scooping in a reverse layup early in the third quarter. She followed that with a 3-pointer, a basket in transition and took a pass from Ellis, who got a steal, to finish another layup for a 63-26 cushion with 2:15 showing.